Before there were Facebook status updates there were T-shirt status updates. I was and still am a big fan of these tees. They provide just enough information to communicate with a passerby and perhaps elicit a smile about one’s view of the world; but not so much that you feel too exposed or vulnerable. They work for introverts and extroverts alike and provide a canvas for puns, word plays, and visual humor. I’m not talking about political tees, sports tees or college tees. They also convey information and may trigger feelings of affinity or disgust in the reader, but they don’t relay the same message of, “This is who and HOW I am right now”. "No this isn’t just fat…this is Just Fat, Righteous Fat, Explainable, Excusable,Temporary, Baby Fat." “We spend the first half of our lives hiding things from our parents and the second half hiding things from our kids." This is great Deah! I have seen those baby shirts as well and thought the same thing. I saw a maternity shirt the other day that said “Does this baby make me look fat” and I smiled at the woman while desperately trying to control my eye roll reflex. It seems like there is enough involved with the creation and first few years of raising a tiny human that it would be an excellent time to be happy with what your body does and however it looks! Thanks Ragen! And as we saw on Facebook there are always going to be exceptions and there will be those who will wear that shirt in the spirit of yay I’m so happy I’m pregnant. 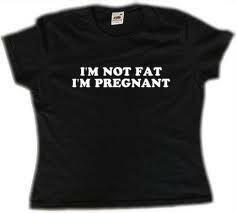 But if you go to the websites where they sell these t-shirts there are comments about how people can wear those shirts if they don’t want people to think that they are fat when they are in fact pregnant! Thanks for commenting! 🙂 Awesome! Thanks for the grin!!! Very important point you make Deah! Brava! Thank you Jean! And if you would like me to let folks know about your new blog please send me the info and I’ll publish it in my next Schmooze-letter! There was a time when I would have pregnant friends say to me “Oh, Im sooooo faaaat”. Of course I would say, no you arent. But I felt is was an insult to me but could never find out why someone would say that to me. Because I am fat? Whatever, huh? Marla, I’ve been in that situation as well! It brought up so many mixed emotions for me at the time about what I thought about my body and what I now thought they thought about my body…etc. There are so many aspects of pregnancy to talk about with your friends the fact that the weight gain and fatness is usually at the forefront of people’s minds and usually for negative reasons, is unfortunate.